rec. 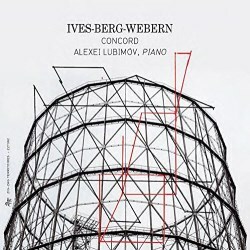 live, Kreuth, 1997 (Ives), Moscow, 1999 (Webern and Berg). In 1995, Alexei Lubimov recorded Ives’ Concord sonata for Erato. It was coupled with Three Quarter-Tone Pieces for Two Pianos and Pierre-Laurent Aimard joined him for the latter. Lubimov apparently toured afterwards, performing the Concord, and this disc features a live recording from 1997 set down in Kreuth; presumably in Germany - the liner notes merely give the name of the town. In addition, two works from the Second Viennese School are tacked onto this album, Webern’s Variations for Piano, and Berg’s first published composition, his Piano Sonata No. 1. Since they were not performed at the same time – the liner-notes say Moscow, 1999 – it seems odd to include them here, but, while works of this type don’t often get linked with Ives, there’s no reason why they shouldn’t be. The Concord Sonata is one tough piano sonata. More demanding than composers like Webern, Berg or Schoenberg, this piece is hard to appreciate for many listeners, and it’s incredibly hard to perform. Nevertheless, it’s well represented on disc; I have a dozen recordings of the work, but there are dozens more. It’s a sort of pianistic Everest, one of those works that performers who are interested in the modern repertoire simply must record at one point in their careers, if they’re capable of playing it well. Ives, in this work, attempted to reproduce his thoughts about the four authors he references in the work - the third being a father and daughter. As he says about Emerson in his Essays Before a Sonata, “Read where you will, each sentence seems not to point to the next but to the undercurrent of all.” As such, the Emerson movement is the stormiest of the four parts of this sonata, as Ives attempts to make each phrase a representation of this complexity. But the sound of the Concord recording is middling; the piano booms a bit, and there is a notable blurring of the rough edges of the work. Listening to Lubimov play this piece, I get the feeling that each movement is not a continuous flow of music, but rather bits and pieces that are cobbled together. I don’t feel the unity of the work; as complex as it is, there is unity throughout. Not just in each movement, but across the entire work, as Ives weaves phrases from Beethoven and American hymns as a way of expressing a universal sound-world. The Hawthorne movement, while perhaps less craggy than the Emerson, opens with some very fast runs across the keyboard. Described by Ives as “a Scherzo supposed to reflect a lighter quality which is often found in the fantastic side of Hawthorne”, this movement is anything but light. Again, the muddy sound muffles the piano here, and the lack of tonal variation makes the music sound distant. Ives’ essay, even though it’s not intended as instructions for the pianist, suggests how this movement should be performed: “The substance of Hawthorne is so dripping wet with the supernatural, the phantasmal, the mystical.” Yes, this is a cacophonous piece of music, but there’s much more than raucous virtuosity at play. Technically, Lubimov is excellent, but he sounds too hurried here; as though he just wants to get through this movement, rather than express its otherworldly aspects. The Alcotts – Bronson Alcott, and his daughter Louisa May – is the shortest movement of the work, and it’s a bit of respite before the crowning movement that closes the sonata. It begins with the most melodic section of the sonata, almost like one of Beethoven’s middle sonatas, before riffing on the beginning of Beethoven’s fifth symphony. If Lubimov shines in this recording, it’s in this movement, where the music is, for the most part, straightforward, and even contains some lyrical passages that almost don’t fit in Ives’ sound-world. In the final melodies of this movement, which Ives suggests represent “a strength of hope that never gives way to despair”, there is a moment of transcendence. The music of the Thoreau movement is elusive; it slips in and out of chromaticism, moves from melodic phrases to wild flights of fancy; builds to a climax which is broken only by a few phrases of flute music, representing the instrument that Thoreau himself played, before decaying into silence. I find Lubimov quite appealing in this movement, as though he really feels not just the music, but Thoreau’s thinking itself. The subtle dynamics here are well navigated, though, again, the flat sound of the piano blurs things a bit too much. Alas, when the flute comes in, it is too distant, sounding as though the flautist is not on the stage. It’s good that Lubimov includes the brief flute solo, which many pianists eschew, but he does not include the viola part in the Emerson movement. I’m not qualified to discuss the Webern or Berg pieces in any depth; while I’m familiar with them, they are not works that I know as well as the Ives. At least in these later recordings, the piano sounds much sharper. One notices musical similarities between the Webern variations and Ives’ sonata, even though Webern probably didn’t know of Ives’ work, and Webern’s work is based on a serialist system. Ultimately, however, the coupling of such a “simple” work with the Ives seems a bit of a let-down. One cannot prevent comparing Ives’ monumental sonata to Webern’s brief ditty. In a different context, the Webern is a very interesting work; here, it is overshadowed by what came before it. The Berg, on the other hand, is far more interesting, and one can hear the similarities between this work, Berg’s first and only piano sonata, with Ives. Lubimov plays this piece with subtlety and grace, but I can’t help thinking that both this and the Webern are just filler, to make the CD come in at more than an hour. After listening to Ives’ Concord Sonata, the best thing to do is sit in silence for a while, which is what Ives seems to have intended, as the Thoreau movement, which ends the piece, fades into the silence of Walden Pond. Perhaps this CD would have been better ending after the Ives, and not adding these two other works that pale in comparison to the great Concord Sonata.